For my first Tuesday Treasure post I thought it would be perfect to share with you one of my favorite family heirlooms: The Alanson Hayes Family Bible. 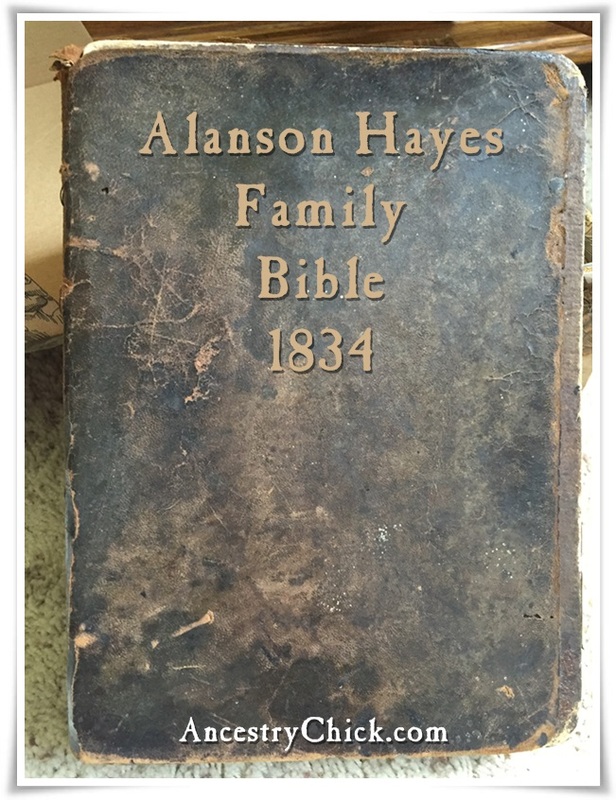 This Bible belonged to my 4th great grandparents, Alanson Hayes, Sr. and Rhoda (Slater) Hayes. Alanson was born in Granby, Connecticut on 17 April 1781. 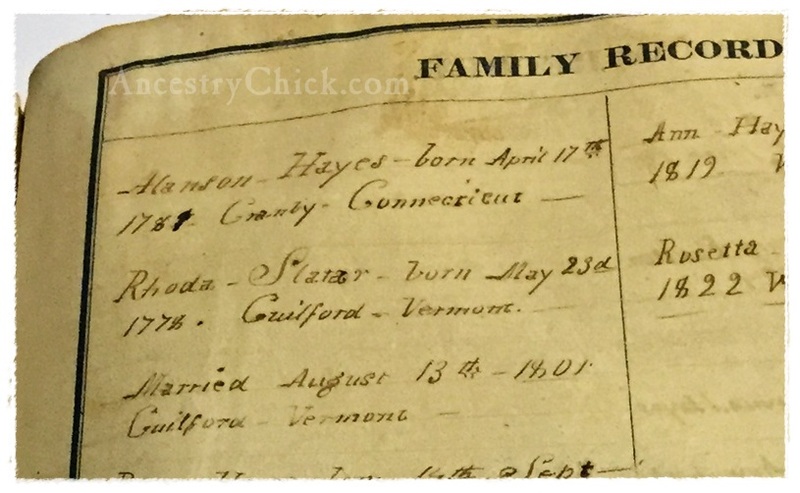 Rhoda was born on 23 May 1788 in Guilford, Vermont. They were married 13 August 1801 (per the Bible) in Guilford, Vermont. This Bible was preserved by the Kephart and Hayes families and gifted to Carolyne (Kephart) Gould in 2002 by Don Drozdenko, also a descendent of Ormand Kephart (who was son-in-law of Alanson). At Christmas, 2003, this Bible was placed in my keeping, as the daughter of Carolyne Gould. 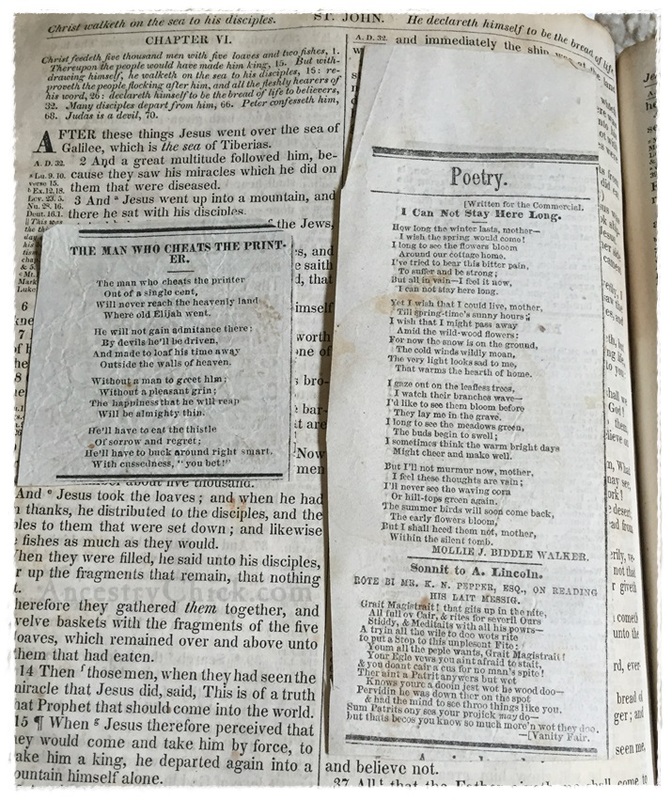 The Hayes Family Bible contained a few little treasures, including a short piece of material marking the Book of Isaiah, Chapters 34, 35 and 36. 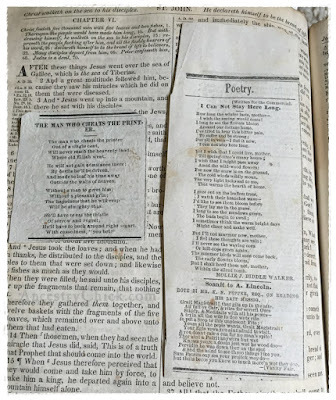 There was also a piece of roughly-torn paper marking the Book of Ezekiel, Chapters 27 to 29. 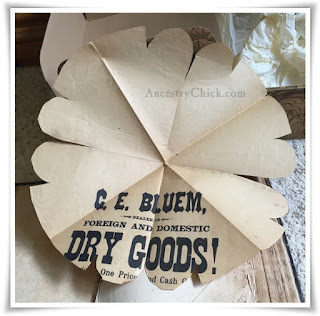 A folded snowflake was near the front of the book, made from old advertising. Hidden within a piece of muslin was a small (about 1-1/2 by 2 inches) photograph. 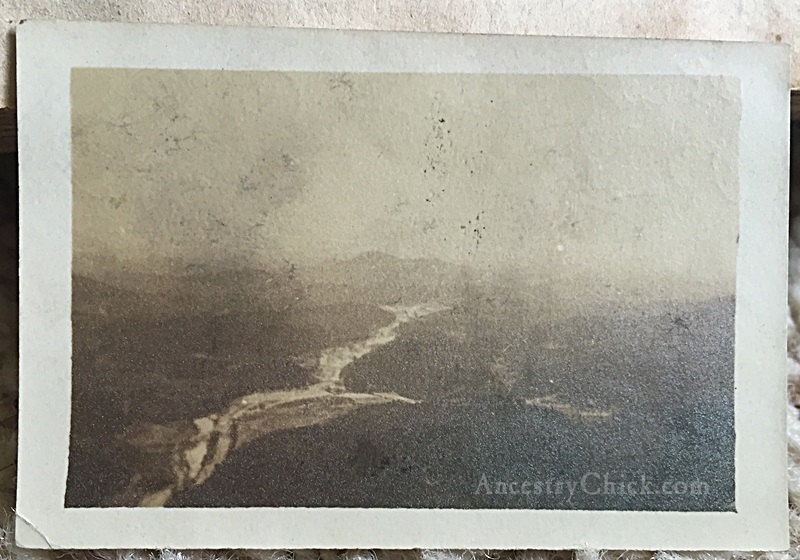 On the back is written the words "View from Chimney Rock." A friend of my mom's from North Carolina says the photo was taken from Chimney Rock, NC, viewing a river that no longer exists due to construction of a dam. In the distance is a mountain that is said to be the home of the "Little People." The Bible also contained the Quarterly Meeting ticket for Alanson Hayes from the Methodist Episcopal Church. This ticket could have belonged to either Alanson Hayes Sr or Jr. Ormand Kephart's name appears on the back of this ticket, so it's possible that the Bible was passed down to Alanson's daughter, Ann Amanda, my 3rd great grandmother, wife of Ormand. There was also a newspaper clipping of a poem, apparently a reprint from "The Ohio Farmer" that was found. And just today I was looking at the Bible again and another poem tucked in the Book of St. John Chapter VI, and a Sacred Song clipping in the Book of II Samuel. 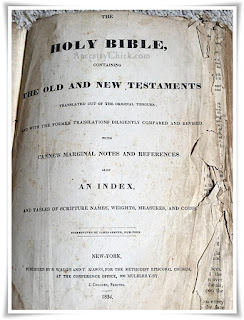 When I stop and think about the fact that I have a Bible that is 182 years old--and that it belonged to my 4th great grandparents, it amazes me. It has definitely seen better days and it's quite delicate, so I have only handled it a few times since my mother gave it to me. It is truly a treasure to me. I think the only thing that would make it more precious to me is if I had a photo of Alanson and Rhoda Hayes to go along with it. Maybe one day. Even without the photo though this is one heirloom I will continue to treasure until my last breath. We might be cousins. What information do you have on the descendants of Alanson and Rhoda? 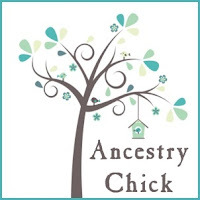 My great-great grandmother was Elizabeth Ann Chapel (or Chappell). I believe Elizabeth's parents were George Chappell and Cynthia Hayes, a daughter of Alanson and Rhoda. Do you have any information that would help me verify that? Hi, Linda! I do believe we are indeed cousins. 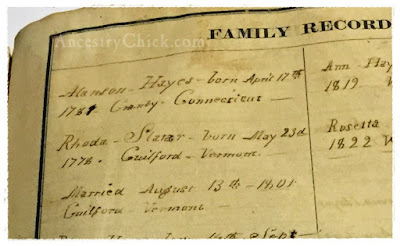 The Alanson Hayes family Bible notes the birth of Cynthia Hayes on 28 NOV 1811 in Jay, New York to Alanson and Rhoda Hayes. Cynthia's marriage to George Chappell is also noted in the Bible on 19 JUN 1826 in Wilmington, NY. Their daughter, Elizabeth married Andrew Johnson in 1849, and in 1850 she's on the Census living right next to her grandparents, Alanson and Rhoda Hayes, as well as her uncle, Alanson Hayes, Jr. On the previous page of the same Census, George and Cynthia appear as well, along with several of their other children (James, Ermina, William, George, Edwin, Josephine). Their surname is spelled incorrectly as Clapper in the Census, but it is them. After I posted this comment, I did find information that I had verified this information before. I have not actively done genealogy research since 1999 and sometimes, I have troubles following my own information. This all came up again last week because I was trying to answer my daughter's question about our relation to President Rutherford B Hayes (I think I'm 4th cousins, 4 times removed). In looking at my notes, I actually corresponded with your mother in the late 1990's. The Bible is really cool! I would love to have a copy of the family pages from the Bible. I don't know if that's easily doable or not. My prized possession is a sampler embroidered by Elizabeth Ann Chapel (how it is spelled on the sampler) in 1840 at the age of 9. My grandmother had it and then gave it to me.